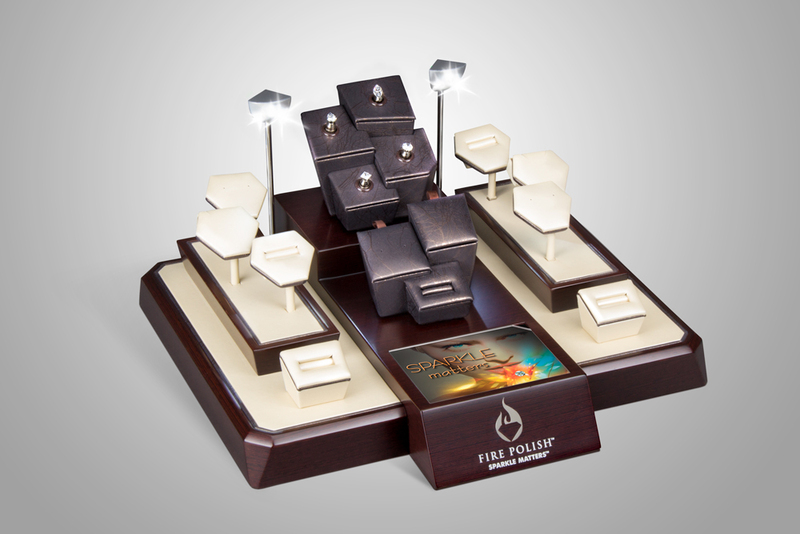 The Fire Polish Diamond Jewelry display program is one of PN’s proudest accomplishments. With LED lights, rotation, and solar power, the display was designed to show the beauty of the uniquely faceted Fire Polish diamonds in motion, regardless of the lighting conditions at any particular retail store. The stunning display program stands as the final result of a long, complex journey of challenges that took PN’s problem solving skills to the next level. The initial small display designed to hold loose diamonds went through many prototypes as elements were added and edited. The first design featured motion generated by solar-power, using one solar panel at the back of the display. However, this only generated enough power to work in selective environments. To provide more stability for the motion feature, two more panels were added to the sides, which could be flipped up or down to capture as much light as possible. Battery-powered options were also implemented to provide maximum functionality.A small light behind the graphic sign ensured that the loose diamonds were lit effectively no matter what the store lighting conditions. In the next phase, the ideas from the small loose stone display were expanded to become a large display that could showcase loose stones as well as complete jewelry pieces. The client wanted to be sure that the products were being displayed at the highest level, a difficult proposition considering it was impossible to know what lighting conditions would be in the various retail stores. The solution was to implement large-scale lighting directly into the display to light the products from above. PN tested a variety of light sources before finally settling on LEDs as the best choice. To really make an impact, the client wanted the lights to light up in a running fashion rather than all at once, meaning the individual LED lights had to be timed perfectly to create the effect. The first attempt did not create the desired effect, and so new placement and patterns for the lights were designed and tested until the running effect was as compelling as possible. Instead of powering the large display with solar panels like its smaller predecessor, PN opted for battery power because it would be more reliable in providing enough energy to power the multiple moving parts. 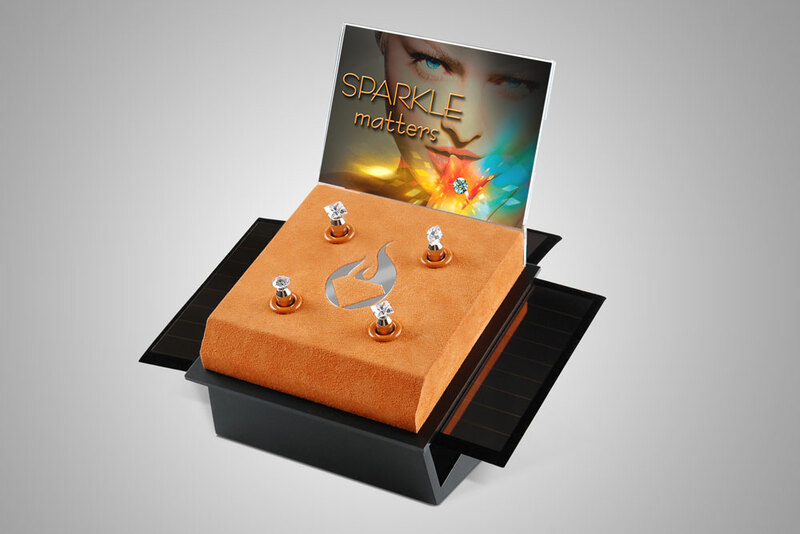 The Fire Polish Diamond Jewelry Display program gave PN many design and manufacturing “firsts.” It was PN’s first experience with lighting acrylic sign holders, as well as their first project that featured extensive solar-powered elements and LED lighting, both of which became incredibly popular. Overall, the project allowed PN to develop a strong understanding of LED light and motion combined with solar power, enabling PN to offer an even broader range of display options to clients in the future.